← A “Cindarella Moment” for Marriage Equality? 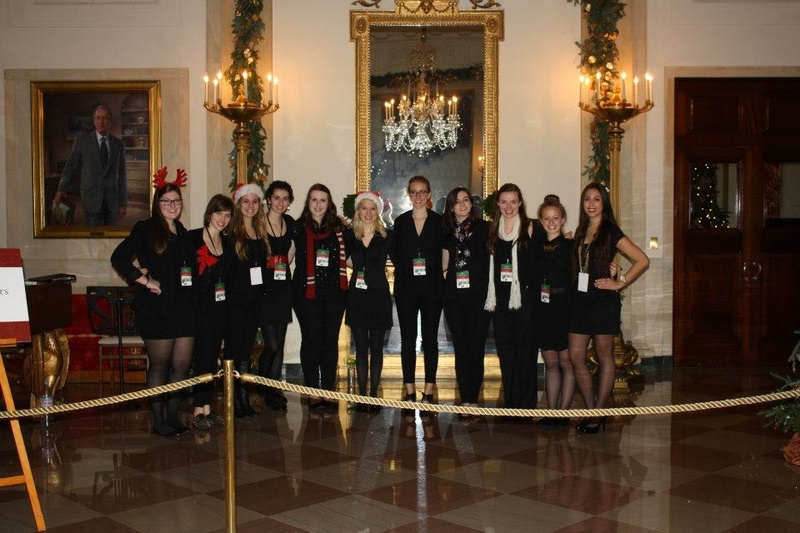 Joy to All: Vocal Point’s Experience at the White House! This guest blog post comes from Bailey Gripshover. Bailey is Vocal Point’s assistant musical director and a double major in brain and cognitive science and music. She will be graduating this spring! Vocal Point in front of the White House. Each holiday season, the White House opens its doors to display its Christmas decorations. Since the 1960’s, the First Lady has chosen a theme for the decor, and tours are given to the public for them to enjoy the festive scene. This year’s theme, ‘Joy to All,’ rang true for Vocal Point, as we were selected to sing during one of these tours! Vocal Point was founded in 1969 and remains the only all-female a cappella group at the University of Rochester. We sing a variety of genres including pop, classic rock, Motown, and of course, holiday! In order to sing at the White House, we had to go through a 3-step process. Part of this included sending them videos of Vocal Point performing, which can be seen on our YouTube site. It was an amazing feeling when we found out about our acceptance, and we immediately started rehearsing. Our set included traditional Christmas carols, Christmas pop songs, and traditional Hanukkah songs! After many extra rehearsals and hours memorizing music, we were ready! Vocal Point departed for the White House on the afternoon of Friday, December 7th. The aunt and uncle of one of our members were kind enough to host us that evening, and after one last rehearsal, we called it a night. Our Saturday started at 5:30am as we dressed up in all black with holiday accessories. When we arrived at the White House, we were directed through a number of security offices. It was exciting to be in a place that required so much protection! Everything was lavishly decorated, and the air even smelled of pine trees. We were directed to our performance area and began to sing promptly at 7:30am! We were staged at the last part of the tour where many people stood and listened to us for several songs. Most of us in Vocal Point enjoy our holiday songs simply because of the joy it brings others. The audience really seemed to appreciate the variety of our set and sometimes even sang along with us! The two hours of performing flew by, and as a thank you from the White House, we were given the holiday tour! 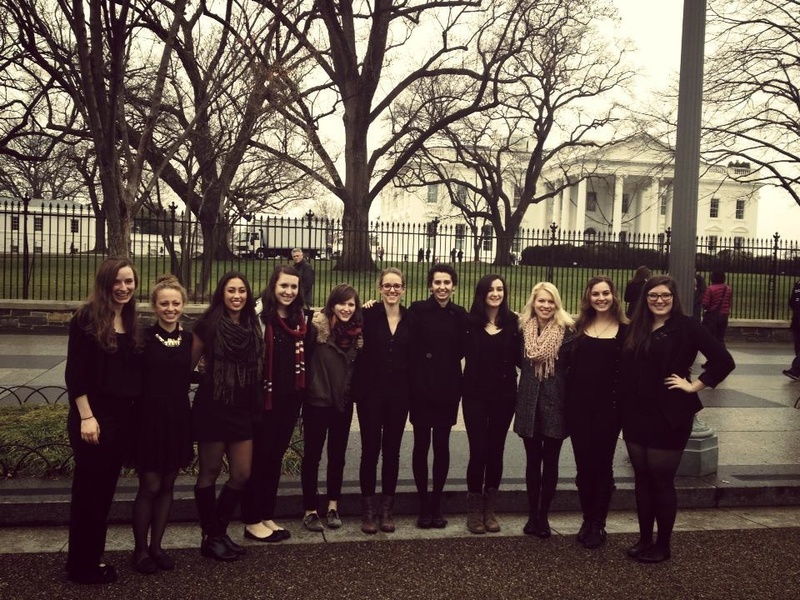 After our experience in the White House, Vocal Point also sang at The Washington Home and Community Hospices. We performed short sets on five of the floors, one of which was for patients with Alzheimer’s. In the crowd was a woman who used to be a music teacher, and she sang along with us word-for-word. That was a truly inspiring moment for us, and we were so thankful to spread holiday cheer with the people there. After this wonderful way to end our day, Vocal Point headed back to Rochester. I have been a member of Vocal Point since fall 2010 and have the pleasure of being the Assistant Musical Director this year! Upon my graduation this spring, I will receive a double major in Brain and Cognitive Science and Music. I have always had an immense passion for music and am very thankful that this university has so many opportunities to pursue this interest. In addition to Vocal Point, I have taken piano lessons at Eastman each semester and participated in NJR and Gospel Choir. It was such an honor that Vocal Point was chosen to sing at the White House, and I could not think of a better experience to have before graduating! This entry was posted in Guest Blogger, News and tagged #acapella, #students, #vocalpoint, #whitehouse, #women. Bookmark the permalink.